Free things to do this wknd ft. Drag and Draw, Chinese NY, Dead Pixels & more. It’s the Year of the Dog (the Earth Dog to be precise) and to celebrate there are a raft of Chinese New Year activities taking place along Southside, if you visited last year you may think you know what to expect but this time around the capacity has doubled in size. Two stages featuring live performances from the likes of the awesome Rosie Kay Dance co. and Chinese circus & acrobats, street performers, streetfood stalls, traditional entertainment, workshops and a fun fair and that’s just scratching the surface. Book for free Hippodrome performances here. Budding artists (or experienced ones for that matter) come along to the Gas Room at BMAG for a life drawing session with a difference. 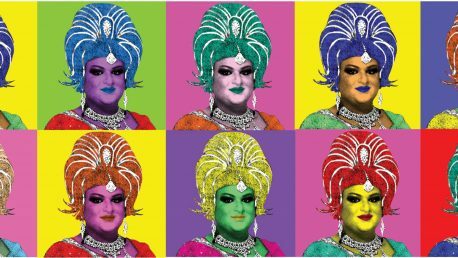 Drag artist Naz will be posing for you scribblers with paper, pencils, boards and easels provided, as well as reacting to the exhibits and occasionally bursting into a Bollywood lip syncing routine. If only art college was like this. Mutes must have had a killer 2017, completing their mutation from their dream-scape origins into a full-blooded krautrock punk band. Their debut album ‘No Desire’ was one of the best things to come out of the Second City last year. So if you haven’t treated yourself to some Mutes yet, go get sweaty and unruffled at the Dark Horse – for free, no less. With support from Witch Fever and Cave Girl. (CD) Read our full preview here. Third birthday party for Birmingham’s finest purveyors of the hypest bass beats across grime, garage, d&b and house. It will get deep and dirty and you need to be there, Fallow and DJ Chalice will be performing alongside the usual killer residents. Just go to the Facebook event page on the link below and tag yourself on the wall for free entry before 12pm. Boom. Matthew Edwards from the affable globe trotting Brummie geezers The Unfortunates has arranged an afternoon of top class local musical talent in aid of worthy cause the Anti-Bullying Alliance. Matthew himself will be performing alongside Retinal Circus, Jowen, Danielle Cawdell with some surprises promised. It’s free but we know you will be digging deep to help out. Retro gaming, big eats, raging beats and live art, it must be Dead Pixels time again. Some 10,000 games to plug your brains into and a stunning collection of street food to plug your faces into. The artist’s theme this time round is nostalgic sci-fi epic Stranger Things so expect The Upside Down to figure strongly. DJs include Doktah Jekyll and Squirrel. Summer may seem as far away as ever with the cold weather gripping relentlessly, luckily for us The Hare and Hounds are filling this Saturday night with glorious musical sunshine to thaw those freezing dance muscles. Tropical vibes and broken calypso beats will be served up by local favourite Sam Redmore with live percussion from Mighty Magoo. Free entry before 10pm.